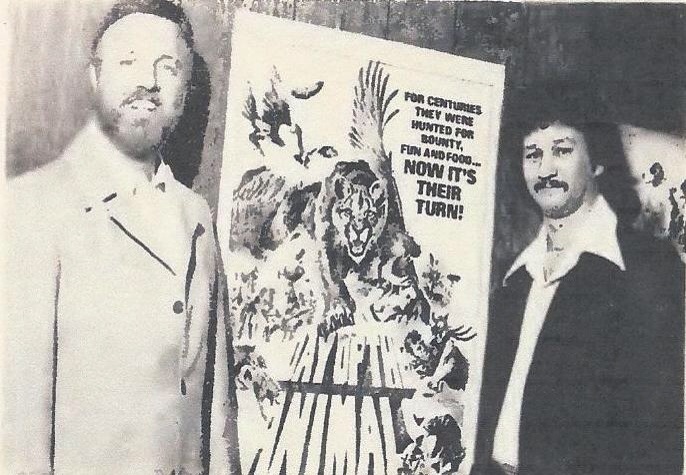 (FVI president Edward L. Montoro (on the right) promoting the 1977 release The Day of the Animals. (Photo courtesy of Box Office Magazine May 1977 edition). If there is one man in the motion picture industry (at least those in the industry that ran a film studio) who has fascinated me over the years, that man would have to be Edward L. Montoro, the notorious owner of the B-movie production/distribution company, Film Ventures International (FVI). Montoro, a man who was widely regarded in the industry as someone that carried a very maverick personality which would probably put Harvey Weinstein to shame; Montoro, a man that was apparently not afraid to take risks; and Montoro, a man that the motion picture industry has forgotten… Why is he forgotten? He has not been seen or heard from since his mysterious disappearance in 1985. But let’s start at the beginning shall we. From all of the research and interviews I have read concerning Montoro and FVI is that Montoro got into the motion picture industry by accident. He was originally from Cleveland, Ohio and wanted to be a commercial airline pilot. However his ambitions were soon put to rest when he was nearly killed in an airplane accident in the late 1960’s and took almost a year to recover. After his recovery period, he relocated to Atlanta, Georgia and was determined to get into the industry resulted in him spending his savings on camera and lighting equipment to make a soft-core adult film titled Getting into Heaven. For all intents and purposes, he managed to sell the film on his own earning over $750,000. Montoro then pushed his business model to make low-budget films for domestic distribution while acquiring foreign films from Europe. His strategy paid off. By 1972, enough private venture capital investors in Atlanta supported Montoro’s plan and thus Film Ventures International was born. To his credit, Montoro was very instrumental in the establishment of the Georgia State Film Commission which he was appointed by then Governor Jimmy Carter to oversee. In part due to Montoro, today Atlanta is a hot bed of motion picture and television production and has some of the best production tax incentive programs in the entire country. But I’m getting ahead of himself. Montoro began buying up European films including the western Boot Hill which was sort of a play off of the Trinity movies and was successful at the box office. It was not until around 1975 when Montoro hit it big with the release of the Italian horror film Beyond the Door. Widely considered a knockoff of William Friedkin’s The Exorcist and directed by Ovidio Assonitis (who went on to launch James Cameron’s film career and ran Cannon Pictures for a brief period of time), the film featured Juliet Mills vomiting green pea soup all over the place, levitating and spinning her head… you’d think this was The Exorcist. Or was it? Well Warner Bros. certainly thought so. They filed an injunction against FVI to stop distribution in the United States for copyright infringement. However Warner Bros. lost the injunction because they did not have rights to key scenes depicted in The Exorcist which were similar to those seen in Beyond the Door. Nonetheless, the Italian horror film managed to rack up close to $35 million worldwide and was at the time the most financially successful independent film ever made. From buying up foreign films, Montoro moved his production operation to Los Angeles and started financing and producing FVI’s own movies. Next came Grizzly directed by the young ambitious filmmaker William Girdler just two years before his untimely death in a helicopter crash in the Philippines, this animal run amok film was considered “Jaws on land” about a giant killer grizzly bear terrorizing a national park and featured a solid cast composed of Christopher George, Andrew Prine and Richard Jaeckel. Financed by Montoro for only $750,000 and lensed on location in Georgia, Grizzly became the most successful independent film of 1976 earning nearly $40 million worldwide with Columbia Pictures taking foreign distribution rights and FVI distributing the film domestically. Grizzly managed to hold the title for the top grossing independent film ever made until John Carpenter’s Halloween came along two years later. Then what usually happens in business? Well, people tend to get a tad bit greedy when they see so much money coming into the corporate coffers. And this was the case with Montoro in which he accused Grizzly’s producers/writers Harvey Flaxman and David Sheldon and director William Girdler of going over budget and that Montoro promptly refused to show them box office income statements, let alone even share the money that they were entitled to under their production agreement. Montoro and FVI were sued by Flaxman, Sheldon and Girdler and eventually the Los Angeles County Superior Court ordered Montoro to pay all of the proceeds that were due. But apparently this didn’t deter Girdler from directing another animal run amok follow up for Montoro and FVI. Filmed in California, The Day of the Animals is sort of like a cross between The Birds and The Poseidon Adventure. Its ensemble cast portraying hikers stranded out in the wilderness included Christopher George and his real life wife Lynda Day George; Richard Jaeckel, Michael Ansara, Andrew Stevens, Ruth Roman… oh and yes, Leslie Nielsen! One by one they are stalked by way of bear, mountain lion, wolf, turkey vultures, hawks, owls, crows, dogs, rats and all kinds of snakes. Day of the Animals is a really fun movie, but was unfortunately not as successful as Grizzly. Meanwhile at FVI, Montoro enjoyed success in the product he released in theaters, particularly in the drive-in and grindhouse circuit. Among the films that he picked up for distribution included: Mario Bava’s Beyond the Door II, Search and Destroy starring George Kennedy and The Shape of Things to Come starring Jack Palance. The Dark starring William Devane is another one of FVI’s movies that is often remembered. It was originally a film about a crazy maniac that was confined to living in the attic in the middle of Los Angeles. However shortly before production started, original director Tobe Hooper was let go and the plot was changed to an alien creature that runs around the city murdering people. Eventually, director John ‘Bud’ Cardos was brought in to complete the picture and it turned out okay at the box office. As the 1970’s came to an end, it was clear that Montoro and FVI had become serious competition to Samuel Z. Arkoff’s American International Pictures (AIP) and Roger Corman’s New World Pictures. Eventually AIP demised in 1980 and Corman began thinking about selling New World, allowing FVI to ‘fill the vacuum’ of exploitation films that were moving into more mainstream territory. Perhaps Montoro was thinking a little too mainstream? In 1982, he acquired all rights to Enzo G. Castellari’s Great White an obvious Jaws clone from start to finish with fairly decent performances from James Franciscus and particularly Vic Morrow, just before his unfortunate death on the set of Steven Spielberg’s Twilight Zone: The Movie. Great White became FVI’s biggest release in the spring of 1982. The marketing budget was close to $4 million and Montoro was aggressively promoting the film. He went to the NATO convention (National Association of Theater Owners) in Las Vegas and brought in two tiger sharks that were set up in a portable swimming pool in the lobby of the Caesar’s Palace Casino to get exhibitors excited about the film. “As far as we know they are the first sharks to swim in Nevada since the place was under seat two million years ago” he declared at the time. Additionally, FVI created thousands of inflatable toy sharks with ‘Great White’ printed on the side and created a special pop-up mailing press book kit to exhibitors as well. The film opened in May of 1982 and just over a week made close to $23 million. It probably would have been FVI’s most successful release… just one problem. Universal Pictures felt the film was too similar to Jaws and sued on the grounds of visual copyright infringement. Universal ultimately prevailed in the lawsuit and the injunction forced FVI to pull the film from theaters and hand over all of the prints and negatives to the court. To this day, the original U.S. version of the film has been unreleased, however foreign bootleg DVD copies of the film pop up all the time on eBay under the title The Last Shark and typically include Greek or Japanese subtitles. But the “Great White Lawsuit” was not enough to sink FVI as some in the industry at the time had speculated. Instead it only encouraged Montoro to grow FVI. He formed a sister company to FVI, Artists Releasing Corporation (ARC) to take advantage of oversees tax credits and acquisitions. Among a handful of films that were distributed from 1981-1983 included Survival Run starring Peter Graves; The Incubus starring John Cassavetes; the notorious video nasty film Anthropophagus; Mark Rosman’s film debut The House on Sorority Row; Don’t Go in the House starring Dan Grimaldi (before hitting it big on TV’s The Sopranos); the comedy They Call Me Bruce; the James Ryan Martial Arts films Kill or Be Killed and Kill and Kill Again; Texas Lighting starring Cameron Mitchell; The Fifth Floor starring Robert Englund and Mel Ferrer and Mortuary starring Christopher George which also featured Bill Paxton in his film debut. Oh and I can’t leave out one of Eli Roth’s favorite films Pieces which remains one of FVI’s more familiar horror movies they picked up for distribution in the U.S. In the midst of the slasher craze of the early 1980’s, Pieces is about a chainsaw killer stalking girls on a college campus. The movie by all intents and purposes is at times unintentionally hilarious. The dubbing is occasionally awful, the acting and dialogue does not make much sense in certain parts of the film and the plot itself seems to change and become inconsistent. Nevertheless, the famous tagline “You don’t have to go to Texas for a chainsaw massacre” made it very popular and has developed a very large cult following. Although Montoro had expanded his production and distribution operation and started changing his business model as drive-ins and grindhouses faded away while VCR’s were starting to boom, he had difficulty in keeping up with the changes. As what usually happens with indie studios, they either get bought up by major corporations or go out of business. By 1984, FVI was still the only mini major studio that continued to ride the wave of exploitation movies. However his competitors such as New World Pictures had been sold to an investment group which took the company public and became more diversified. Similarly the former American International Pictures and AVCO Embassy Pictures became part of larger conglomerates. New competition was emerging with Cannon Films under Menahem Golan and Yoram Globus who took a proactive approach to film financing by pre-selling territories overseas to generate larger budgets for their independent films. Obviously FVI could not sustain its business model strictly only as an independent and not tap into the emerging ancillary markets at the time. Perhaps it seemed like the independent days were numbered, unless you took your film company public and capitalized on the success of the growing VCR market. In a May, 1984 edition of The Hollywood Reporter Montoro seemed to predict FVI’s own future by stating “[independents] have to spend $2.5 – $3.5 million to compete on any level at all.” This was becoming the obvious case with FVI. It quickly became a major indie studio in the early 1980’s however it was now becoming cash strapped by failing to keep up with the technological trends of the 1980’s. Montoro’s last hope and glory came with the 1984 release of Mutant starring Wings Hauser and Bo Hopkins and directed again, by John ‘Bud’ Cardos. A well done zombie film, it was a shame Mutant did not have the larger theatrical release it should have. It did poorly at the box office and contributed to the eventual collapse of FVI. And Montoro never did return to his office. In addition to his crumbling operation through overspending on films like Mutant, his wife of many years filed for divorce which seemed to push his decision to leave for good. Apparently Montoro’s stock redemption allowed him to move on to other things. We don’t know exactly what those things are: If he started another business or took an early retirement… who knows… but the speculation was that Montoro left the United States for Mexico or South America. He’s never been seen or heard from since. FVI was eventually acquired by Irv Hollendar, a television broadcasting executive who bought FVI out of bankruptcy and merged it into his Independent Networks, Inc. FVI continued to operate as a low-level distributor until the early 1990’s before the company vanished for good. A few years ago Hollendar’s son Darrin produced the remake of Mark Rosman’s The House on Sorority Row which was simply titled Sorority Row starring Rumer Willis and Briana Evigan. Maybe several of FVI’s movies will get the remake treatment soon? FVI remains an important part of the motion picture industry regardless of what some people might say and of course they are entitled to their opinion. While many people typically regard FVI as just another exploitation film distributor of the 1970’s and 1980’s, it was a film company that managed to break box office records and accumulated success from small low-budget feature films. FVI, along with AIP, New World, AVCO Embassy and Crown International Pictures, played an influential part in revitalizing the way independent films were produced, marketed, distributed and exploited. FVI managed to take risks on low-budget films similarly to how Arkoff or Corman would view these films and make them profitable. FVI has certainly impacted me over the years as the independent film days of the 1970’s and 1980’s were a major influence in my own decision to eventually get involved in the motion picture industry. Without question I am sure Montoro had his set of flaws as a person and as a businessman, but as a distributor, he really understood an audience and understood how to deliver product to that specific market. He certainly inspired me. Not necessarily the negative aspects that Montoro was involved with, but with particular regard to how he sold movies, was (and continues to be) an inspiration to me as a person and as a producer of independent films. Wherever Ed Montoro is today, whether he is dead or alive, he contributed his part to the motion picture industry and has a growing fan base of movie buffs that continues to grow to this day.